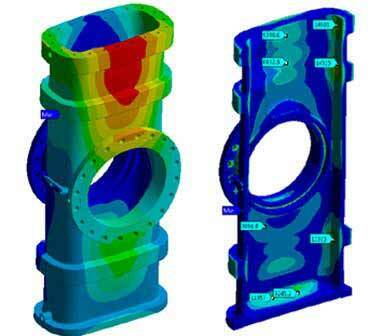 Solution: The gate valve design was first analyzed as per the given loading conditions to measure the stress and deformation values across the geometry. To reduce the deformation value to an acceptable limit, the valve geometry was re-modeled with an additional rib on the outer surface. The following structural analysis for the new design showed considerable reduction in deformation values. Gate valves must withstand stresses generated due to the flow of high pressurized fluid. While these valves possess complex geometries, there are chances of development of high concentration regions across the geometry. These stresses cause the valve body to deform and cause the valve to become inoperable. There is a certain deformation limit for every valve based on the type of its application. A US based design consultant needed a quick solution to address the deformation issue related to their valve body design. The existing valve body was first analyzed under given operating conditions to identify stress concentration regions. It was observed that the deformation values across the geometry were exceeding the permissible limits. The structural analysis also helped in figuring out the material’s factor of safety across the geometry. The new body design was suggested based on the analysis results by applying ribs, thereby providing additional structural strength to the valve. The subsequent structural analysis performed for the new design showed beneficial results, reducing the deformation below the specified limit.